Wall Street spent years hyping, propagating, and funding the oil and gas drilling boom in the US. It handled the bonds and loans issued by often junk-rated companies. It instigated the waves of mergers & acquisitions, profiting every step along the way – advisory fees, bridge loans, syndication of loans, underwriting of bonds, etc. At the very tippy-top of the market, it pushed in the opposite direction and instigated spinoffs, creating independent publicly-traded companies that didn’t have a chance and cost unsuspecting investors in their shares and junk bonds a barrel of money. It orchestrated a series of similarly misbegotten energy IPOs. Wall Street made money off the entire spectrum of companies associated directly or indirectly with oil and gas. It was one heck of a party. The money had to keep flowing. Fracking is a capital intensive treadmill for companies that spend a lot more on drilling and completing wells than they get in cash from their production. Barclays estimated that larger drillers outspent their cash flows by 112% and smaller to midsize companies by a breathtaking 157%. The hole had to be filled with new money, or else the music would stop. Wall Street hyped these junk bonds, leveraged loans, or new shares and pushed them into the hands of investors that had been bamboozled by the Fed into thinking that it had removed all risks from the equation. Investors closed their eyes and bought these nearly risk-free securities that are now decomposing before their very eyes. But it didn’t matter to Wall Street because investment banking revenues were soaring, and because private equity firms where attracting a tsunami of money for their energy funds, and they all extracted their fees, and everyone got big bonuses, and to heck with the rest. The money came from all directions, from TBTF banks, from local and regional banks, from PE firms, overseas investors, pension funds, hedge funds, mutual funds, and individual investors. 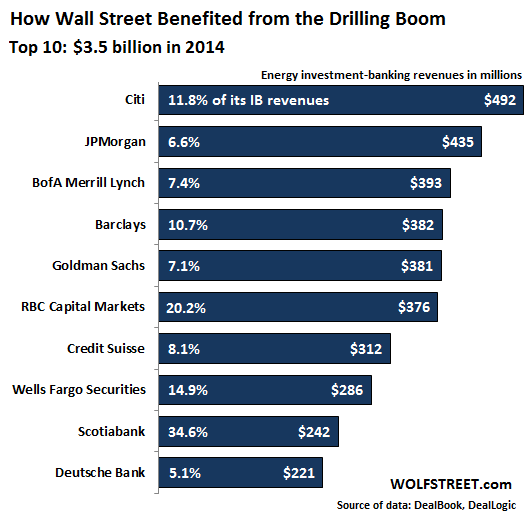 But here are the top 10 banks, according to DealBook, that in 2014 extracted the most investment-banking revenues from the oil and gas sector, or rather from its investors. Bailed-out and still troubled Citi was the king of the hill, obtaining $492 million in IB revenues from the oil and gas sector, representing 11.8% of its total IB revenues. Together, the ten skimmed off $3.52 billion last year. 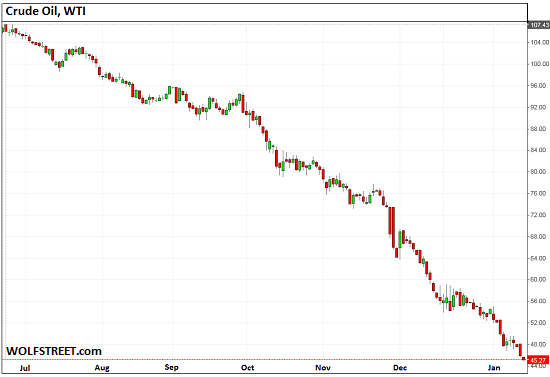 WTI plunged 58% since June to $45.26 per barrel as I’m writing this. The bloodletting simply doesn’t want to stop. The price of natural gas plunged 40% in seven weeks to $2.82 per million Btu. Despite the crashing energy stocks, mauled junk bonds, and beaten-down leveraged loans – all of which began to crimp Wall Street’s style – these 10 investment banks were still able to yank $3.5 billion from the sector and its bleeding investors. That’s true art. The US is the world’s largest producer of hydrocarbon fuels – oil, natural gas, and associated liquids such as natural gasoline, condensate, and propane. So the broad price collapse will inflict more losses in the US than in any other country. But the US has a vast and diversified economy, so the losses won’t be felt like they’re being felt in Venezuela or Russia. But they will be felt. The oil bust in the 1980s devastated the oil patch economy. It took down numerous local and regional banks as the losses were cascading through the system. The FDIC was busy auctioning off homes and office buildings. Businesses shut down. People left to find jobs somewhere else. This time around, Wall Street got involved in the boom up to its ears. And Wall Street is going to struggle with the aftermath. Nearly 15% of Well Fargo’s IB revenues were from the oil and gas sector; Canadian Scotiabank got nearly 35% of its IB revenues from the sector. A good part of these revenues are drying up as new funding activities are hitting reality. There will be defaults. And banks will lose their shirts on deals that soured before they could shuffle them off as planned to unsuspecting Fed-blinded investors. Despite Fed assurances that it had abolished all risks and that investors should no longer be rewarded with yield for taking risks it had abolished, investors find themselves suddenly confronted with terrible risks – for example, loans they considered nearly risk free because they were collateralized by oil. And losses are mounting. That deal was all about the Saudis buying UBS, which needed Congressional approval. Beal’s rant stirred up public pressure on Congress which backed off. You all have presented the case with clear vision. Mike Maloney told the Russian bankers at a seminar. His prediction of $10 oil doesn’t look so wild eyed at this juncture. That would even bankrupt the Saudis. Of course the TBTF banks are up to their skinny necks in this fiasco. But, it’s the lower-tiered banks that are at biggest risk of having to first, suspend common stock dividends, and second, default on their bonds while burying their heads deep in the BK sand as they crumble to memories and so much crumpled paper waiting to be compacted and recycled at hundredths of pennies on the dollar. Here are the Yahoo Finance six month charts for two seemingly doomed bank stocks I have been watching come undone, Canada’s TD Bank (which has a U.S. division), reputed to be the fifth largest bank in North America, and, Utah’s Zions Bancorporation, both heavily invested in the shale oil flimflam. The Wall Street high frequency traders are slowly ratcheting these now worthless stocks downward, shorting and trying to divest their holdings before the sure end, which is already plainly written on corporate headquarter ledgers in big bold letters in red ink. Depositors in these and similar banks would be well-advised that they are likely looking at a long, slow, frustrating and infuriating waltz with the FDIC, if they don’t take defensive measures before the truth rises to the surface and the face-down, stinking, floating carcasses of these and many other similarly shale oil invested banks are out in the open for all to see. The large institutional holders of these (and many similarly effected) bank stocks are feathering their positions into the dupe-and-sucker funds (like IRAs) they manage for pensioners and other unwitting fools that let the “professionals” manage their money. It should be criminal, because these scoundrels know full well they are selling worthless paper. But no one on Wall Street gets prosecuted for selling junk at inflated prices. This is the sort of thing that generates bonuses and career advancement. Anyway, here are the two six month charts that make what is happening all the more real for those who are standing there dumfounded, looking like deer caught in the headlights of an oncoming semi. Just to add a dimension to your analysis, consider Canada’s tarsands plays, which have even higher costs per barrel than shale. This story seems to focus solely on shale, which I’m sure the tarsands companies are mighty thankful for, because their situation is easily as from an income statement perspective. That said, TD isn’t only vulnerable to shale plays, you can bet they have exposure to tarsands as well. Oh, and let’s not forget the entire Canadian economy, which is supported by its #1 export, oil. Looking for a nice safe short to profit on this devastation? Think Canadian banks, and although TD may be more exposed, RBC (largest canadian bank)is a much more liquid trade, and as I’ve explained, the entire Canadian economy is literally on the brink right now, after all commodities have already crashed. And like the halcyon days of TARP, TBTF banks will be asked/prodded to scoop up weaker regional banks at discount for a song with BODs at regional banks will be told to either you get acquired at severe discount by TBTF pals or no soup uh bailout for you! Would that include the all-time high oversupply, and 200-500 years of proven reserves currently recorded? I think the peak oil story can finally be put to bed now. 200-500 years of proven reserves? I would love to see your reference for that claim. Here is a situation where the Oil Companies drill using a new method called fracking. It works! The oil and gas comes rushing out of the ground. As a result we have an energy glut. This is what we call “shooting yourself in the foot”. You can’t win. The Oil Companies have succeeded in a very technological method and then get slammed by that success. Supply and demand is not following the script. There actually is a shortage relative to demand (but not relative to consumption). These are two different things. Constrained supply can indeed be the spark for a bidding war … if the customers have the means to bid. Constrained supply can also diminish the bid by undermining the customers’ means. The price can decline and still be too high for customers … as their means vanishes faster than the price can drop (one being linked with the other in a positive feedback loop). What pushes the bid for any good is credit … what undermines the bid is also credit. What is underway right now is the collapse of credit not only in the US but in other countries. Some of the volatility is emerging as higher interest rates, where rates are repressed, the volatility is emerging as currency depreciation. The result is the vanishing of means for millions of customers = diminished bid for fuel. Once again, we failed to learn from the past, i.e., the 1980s, when we overproduced from the Chalk, spurred a glut and the Saudis pinned our ears back the second time. 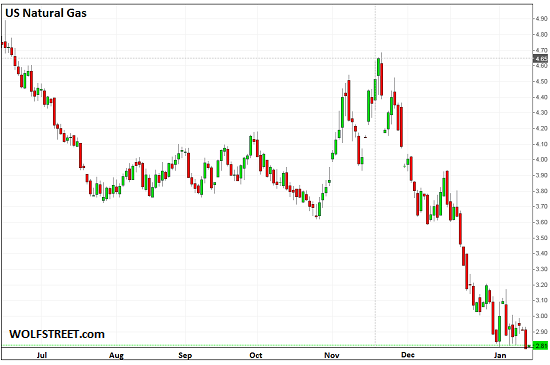 Greed killed this boom also – the producers just couldn’t control themselves. You can’t go to a gun fight with a knife. We will never be able to out produce the Middle East. But the government could create a North American market only and control production and prices. Hmmmmmmmmmm…..
Huh….Crime on Wall St. Imagine that? Sounds like ‘business as usual’, to me.